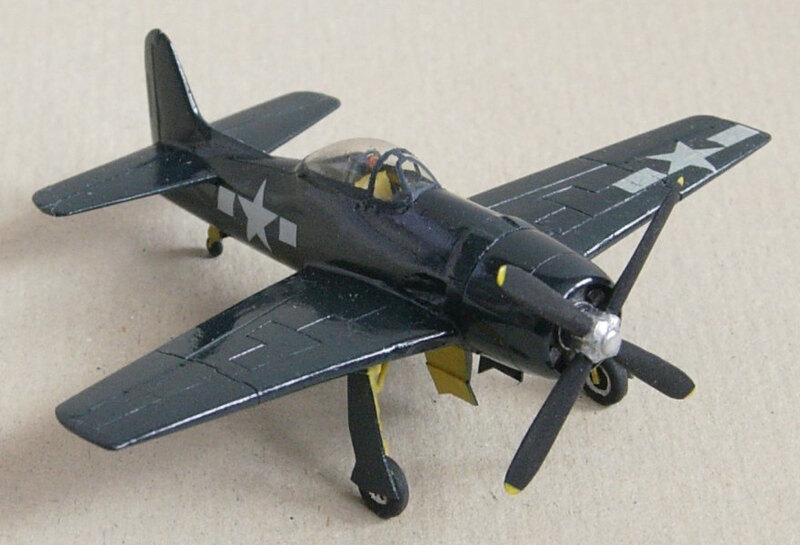 There are two 1/144 Corsair kits I know of, theRevell/Lodela F4U-1 and this Mitsuwa kit (actually in 2018 AFV Club released a pair of 1/144 scale F4U-1 kits with superior detailing). The Mitsuwa kit comes with a 'birdcage' canopy, but I wasn't sure it looked right, so I changed it into a blown canopy and displayed it open which is what I usually do with US Navy aircraft. The kit has some flaws, the shape of the vertical fin doesn't look right, this only takes a bit of sanding to fix. The worst flaw is the angle at which the wing is mounted to the fuselage. 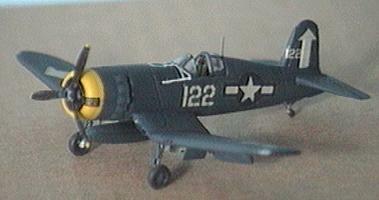 With the real Corsair, the wing is set at an angle, the wing in the kit is set level with the fuselage center line. I cured this by cutting the wings off the center section, only to find that I needed a wedge between the fuselage and the rear end of the wings to fill the gaps. I did not manage to lower the trailing edge all the way to its proper location, to hide this I decided to drop the flaps. 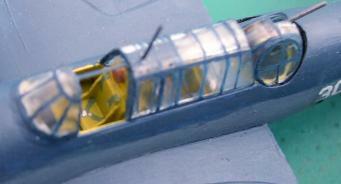 Details added to the kit include an arrestor hook and some bracing to the landing gear, pitot tube and wing tip navigation lights. I fitted a single aux fuel tank to the starboard wing pylon. I also added some details to the cockpit (seat, instrument panel, stick, headrest). I applied the kit decals to the model, but added arrow signs for the upper and lower wings. I painted all the blue parts of the decals over with insignia blue and also painted the sealing tape for the fuel tank in front of the cockpit by hand. Date finished: April 16, 1982. This Revell/Lodela kit reminded me a bit of Revells old 1/72 F4U-1 kit, in particular the shape of the cowling. 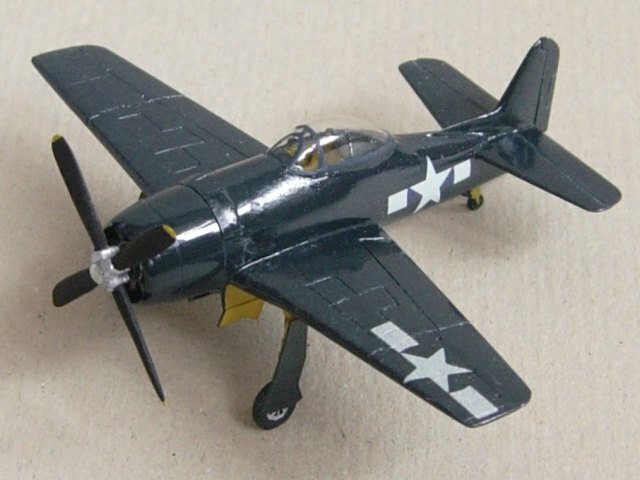 I like the shape of the fuselage and cowling of the Mitsuwa kit better, but the Revell kit does come with the right diameter propeller and it takes a lot less work to make the Revell kit look like a proper Corsair. I separated the canopy from the windshield using a fine jig-saw blade, added some cockpit interior (headrest, floor, stick, seat and instrument panel), added some details to the landing gear and added aerial masts, a pitot tube and an arrestor hook from stretched sprue. I used the decals that came with the kit (the original H-1023 version). I finished this kit decades ago (before 1977 when I began to keep track of what models I had finished). 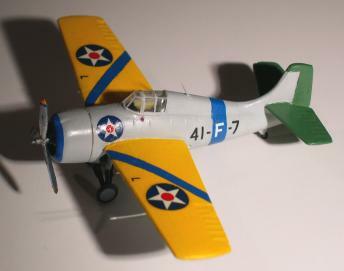 The old Revell Wildcat kit (H-1026) is a cute little kit that comes with decals for a blue/gray war bird. 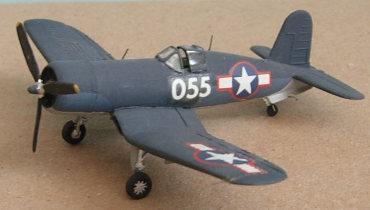 However I preferred to do a pre-war carrier based F4F-3 with its bright colors. Changing the kit from F4F-4 to F4F-3 is easy: just remove the wing fold lines, fill the outer shell ejector ports and add gun barrels for the innermost wing guns. Adding a second pair of bracing struts to the landing gear, a pitot tube to the port wing, a new forward canted radio mast and opening up the tiny windows in the belly completes this kit. Finding pre-war markings for it is a different matter, I ended up doing most of it by hand because I could not find any decals small enough, apart from the wing insignia and the lettering. I painted the fuselage Light Gray (a mix of 3x Humbrol 64 (light gray) and 4x Humbrol 34 (flat white) which comes close to ANA.602/FS.36440). 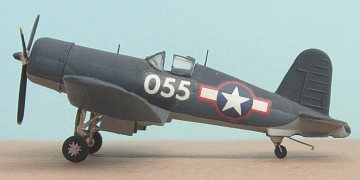 The model depicts the section leader aircraft of the 3rd section of VF-41 aboard USS Ranger (CV-4). Date finished: July 20, 1986. This model started out life as a Mitsuwa Hellcat. I happened to have a spare Hellcat kit and had just read about how Grumman designed the Bearcat by removing all redundancy from the Hellcat design, so I decided to give it a try. I scaled down a set of Aviation News scale drawings, dug up a couple of reference pictures and started off. cowling: 1/144 Crown B-26 cowling, sanded down to shape. fuselage spine: 1/144 LS F-16 droptank half. prop: Crown 1/144 B-29 prop with reshaped blades, clipped tips and a reworked boss. main landing gear: 1/144 Crown Riyusei, modified and extended. canopy: plugged heated acetate over a thick piece of bent vinyl coated electricity wire. Once you have all the right parts, get out your X-Acto saw and start cutting ! Remove the center section of the wing, cut away the fuselage spine, cut off the vertical fin, cut off the forward fuselage and shorten it, don't cut your fingers and don't cut off the tail wheel ! Using the tail wheel as a reference, locate all the bits over the scale drawings and turn this jig-saw puzzle into a Bearcat. Hint: I only had to use plasticcard for the base of the canopy, the new rudder and the main wheel doors. Note that a Revell/Lodela Hellcat kit is less suitable for this conversion because of its thin and fragile parts. 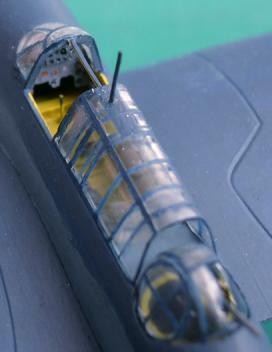 The Mitsuwa kits fuselage walls are over 1.5mm thick, it has an integral cockpit bay and solid single piece wing and tailplane, making sanding and rescribing just that bit easier. Date finished: July 31, 1988. Some scans of relevant parts of the scale drawings used: Aviation News F8F drawing pt.1, Aviation News F8F drawing pt.2 and a Janes F8F 3-view to provide the correct shapes of the elevators and tailfin. Apart from adding a pitot head to the port wing tip, detailing the engine and the cockpit, opening up the canopy and adding a gun barrel to the tail gunner position, I did this kit straight from the box. 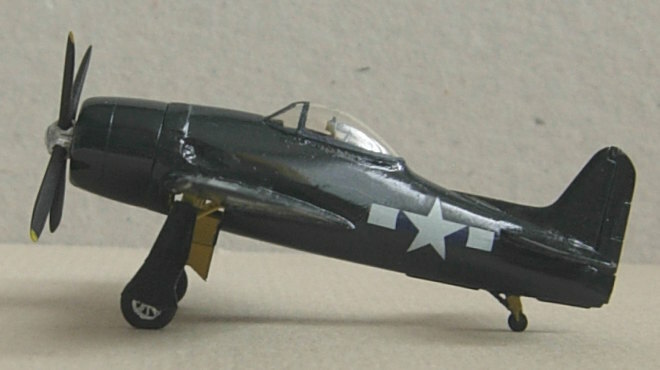 The paint scheme depicts an aircraft of VT-9 aboard USS Yorktown, 1944. Date finished: January 2, 1985.